I've always wanted to go to Syria. And though I finally have a passport that's free of those Israeli stamps that would stop my journey right at the border it would seem I'd better hold off those travel plans for now. And focus on food travelling instead. 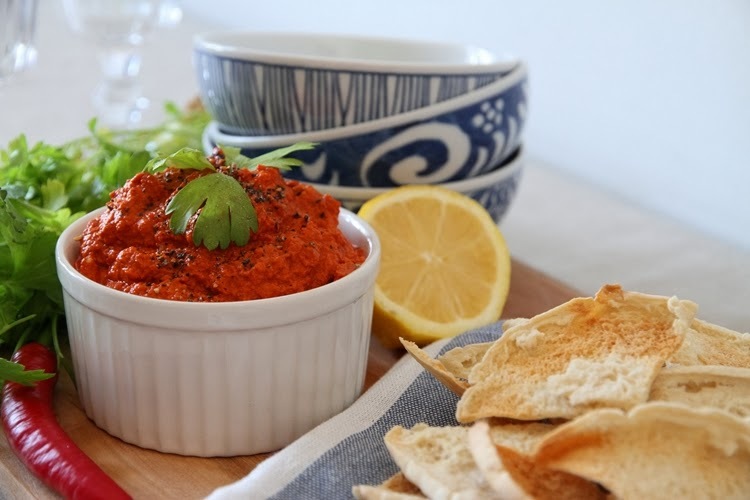 Muhammara is originally Syrian dip made of roasted pepper and walnuts that has since gained popularity around Middle East. It gets the name from its red colour. It is a great addition to a meze table as a dip for pita crisps or crudites, as a spread in a sandwich and as a cold sauce for grilled meats such as köftes or pinchitos. Muhammara has a distant relative in the Eastern European cuisine as well: this is similar to adjiki- paste that I have encountered both in the market halls of Tallinn and the Ukrainian Pelmenit- restaurant in Kallio. And it does have more than a passing resemblance to the Spanish romesco sauce. Each Fatima and Aisha has her own way of doing it - this is mine. Feel free to alter it and make it your own carefully guarded family recipe! The key ingredients are roasted peppers, a couple of spices and toasted walnuts. Some recipes call for breadcrumbs to thicken the sauce, but mine is bread-free and , as such, gluten- and carb-free. Though walnut is the traditionally used nut for this, it does have a tart taste that not everyone likes, so it could be substituted with a milder tasting nut or almonds. I used a 260g jar of roasted piquillo peppers that I also used for Pimientos Rellenos. If you roast your own peppers (see instructions here) you will need three largeish ones. This was a great opportunity to put that pomegranate syrup to use - it hasn't seen much action since those Syrian chicken livers! Toast the nuts either on a dry pan or in the oven at 175°. Keep an eye on them and be careful not to burn them! Roast the peppers and blizz all ingredients in a blender apart from the spices and oil. Toast the spices on a dry pan for a while and then add oil. Mix and pour into the blender. Add pomegranate molasses and lemon juice to taste and season. I'd recommend to let this sit in the cold at least for an hour before serving as this helps the flavours to develop and come together. This also thickens the texture. Scatter some freshly ground black pepper on top and serve with parsley, lemon and toasted pita.